The recently completed SuperWine wine salon that took place in the luxury yacht marina Porto Montenegro in Montenegro hosted selected European wineries and once again reaffirmed its status of the most attractive wine event in South East Europe. 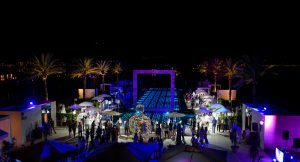 Following suit of the past five years, the start of the summer season in Porto Montenegro was marked by the exclusive SuperWine wine salon, held at the Porto Montenegro Yachting Club swimming pool in Tivat. This year’s salon welcomed a record number of exhibitors and guests, and if we are to trust their judgement, it probably had the best quality wine offer so far. The popularity of the Italian wines with the local visitors was rewarded through the participation of the champions of the Italian wine school, such as: Bertani, Mazzei, Ca ‘del Bosco, Tinazzi, ArnaldoCaprai, Santa Margherita, and Fontanafredda.When it comes to the local favouries, just like before, this year the complements from the visitors went to Montenegrin wineriesKrgović and Castel Savina and their Macedonian colleagues from the Tikves Winery.Wineries from Serbia: Kovačević, Zvonko Bogdan, Lastar, Petar and PIK Oplenac once again justified the invitation to SuperWine and confirmed that they belong among the distinguished European wine houses. Same goes for the Vista Hill winery, which, with its first appearance at the SuperWine Wine Show managed towin the hearts of wine lovers in no time. Other ex-Yu colleagues, mostly represented by their signature wineries Jakončič, Bodren, Enjingi, were greeted with true ovations even from the demanding wine audience. The lovers of sparkling wines have found their favorites at the booth of the famous Vallformosa, and perhaps the world’s most popular Prosecco from the Italian Mionetto winery. Lovers of serious white wines had the real privilege of tasting the famous Chablis wines from the French winemaker Jean Durup, as well as the famous Rieslings from the Austrian wine house Nikolaihof. The visitors were able to enjoy exclusive rakis from Nasa Mala Destilerija and Zaric Distillery, while the Mediterranean food lovers could enjoy the gastronomic delicacies prepared for the Zaliv MN, Montefish and Batricevprsut booths. ‹ Everything is ready for SuperWine 6.0!